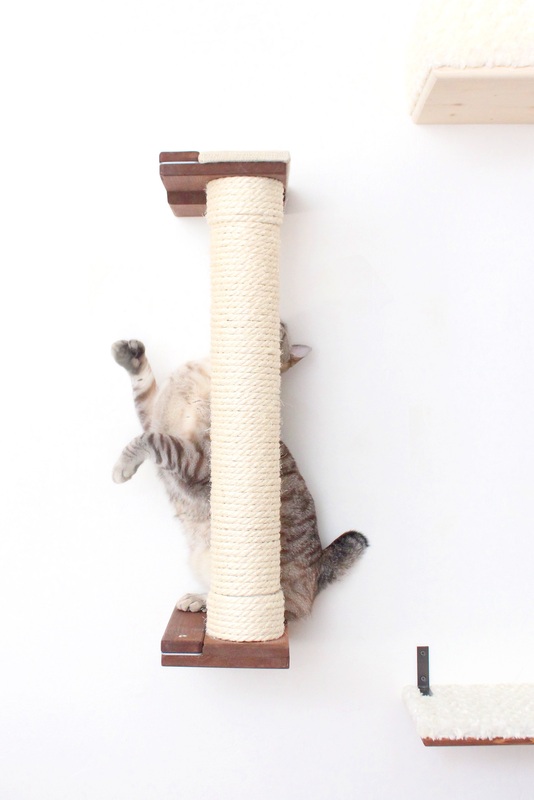 The vertical sisal pole allows cats an outlet for their climbing needs. 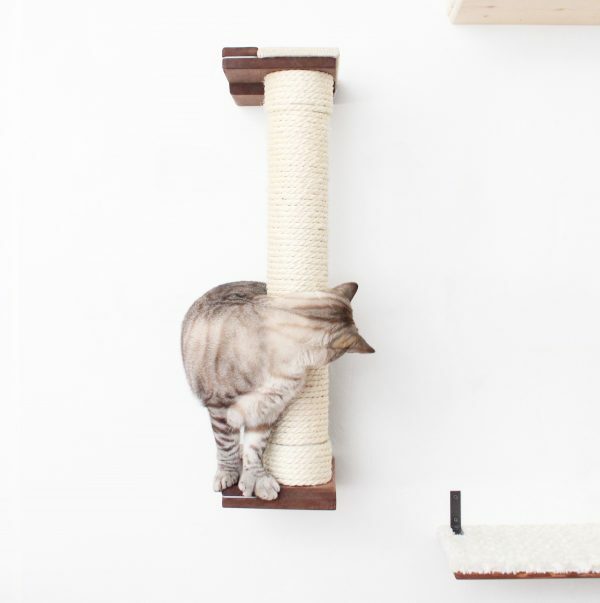 This is a great way to save your furniture from being ruined by scratching and since it’s part of the Cat Mod collection it can also be built onto at a later date. 1 – Sisal-lined pole at your desired height attached to mounting planks. Connected Cat Mod items will attach on the left of the pole. 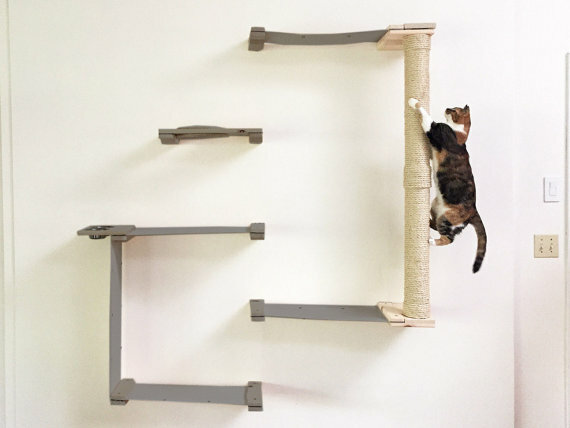 Would you like to add a Feeding Station or fun Escape Hatch onto your wall-mounted setup? Check out our Cat Mod Add-ons. 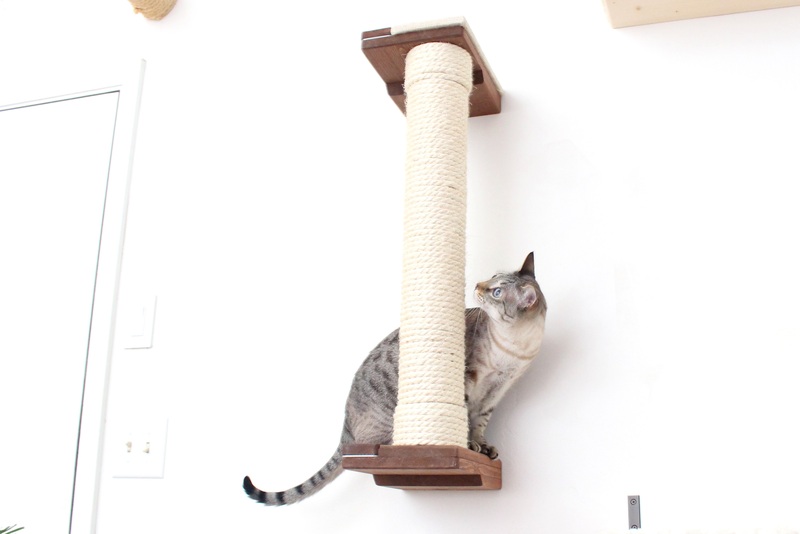 By default, we will build the individual Cat Mod – Sisal Pole with the connection on the left. 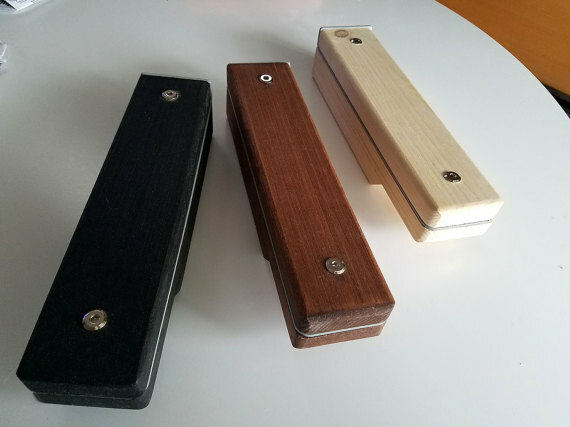 If you would like the connection to be on the right, please leave a note in the order comments section. There is no additional charge for this. 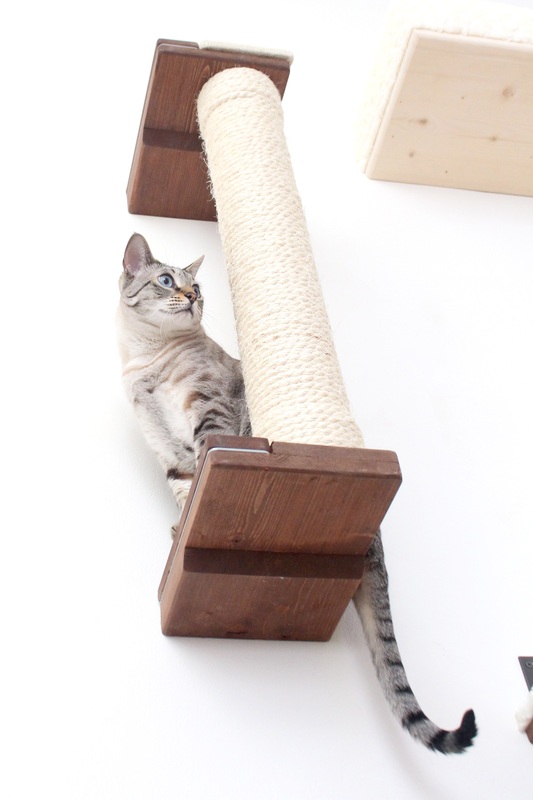 All Cat Mod poles will come with Nickel brackets and can be purchased in Onyx, English Chestnut or Unfinished wood. This can be connected onto any of our Cat Mod collections or added as a standalone addition. Get creative by mixing our add-on items and sets! We’re excited to introduce The Cat Mod, the second generation of our fabric cat complexes! 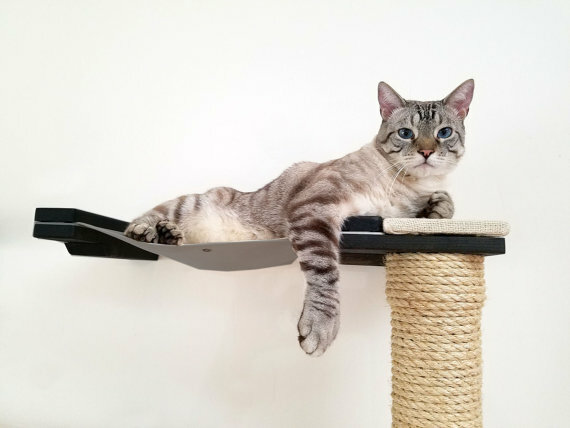 When creating the Cat Mod, we made sure to maintain all the positive aspects of our original collection of cat hammocks and complexes such as strength, appearance, and quality, while also adding some new and exciting features that elevate it from the original collection. Our newly patented system has a lot of great advantages, including its washable cotton canvas. 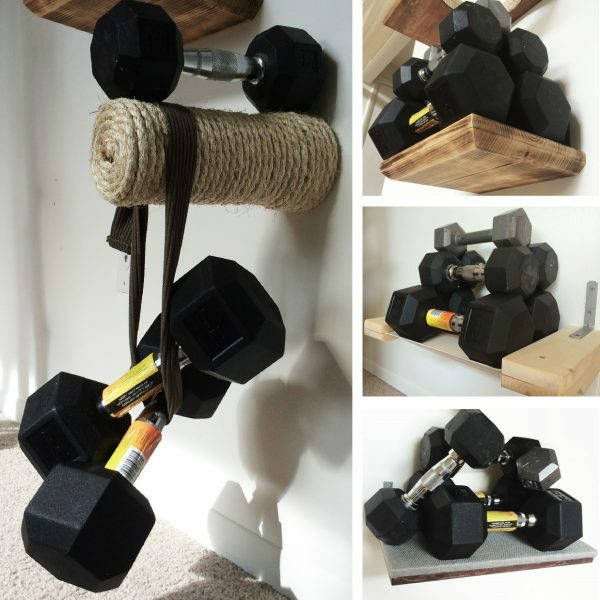 This system allows you to remove the fabric from the structure without having to take down any of the mounted planks from your wall. Not only will this make cleaning a breeze, but it will allow you to continue to build the structure at your leisure. This gives you the option of switching out canvas fabric colors down the road. If you wash your Cat Mod fabric, be sure to use a cold, gentle wash and then hang to air dry. Another great feature is that these complexes are modular; you can build any design you dream up. The Cat Mod system is like the building blocks you used as a kid. We created it to allow customers to build on or rearrange the pieces for limitless design options. We will be including schematics to build some standard configurations, but we hope to inspire you to come up with your own unique complexes! We use solid wood for the mounting planks and thick heavyweight canvas for the hammock. Brackets come attached for easy installation. All of our furniture also comes with screws for mounting. If you’d like to take a look at how the Cat Mod works, please check out our basic mounting guide! The dye lot for our fabrics can change from time-to-time, as it can with any fabric manufacturers. This isn’t something that we can control. 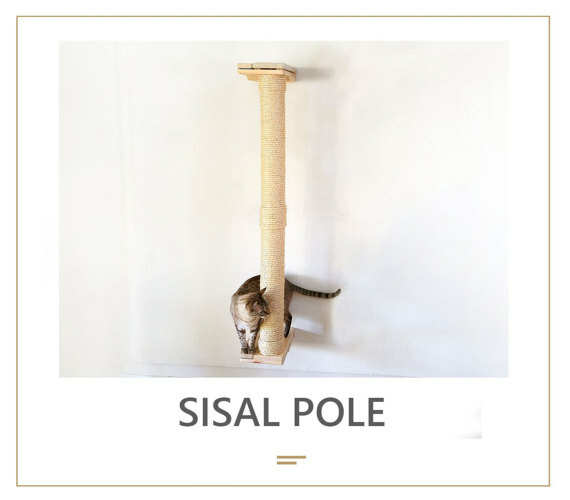 **Please note that this listing is for one vertical sisal pole. 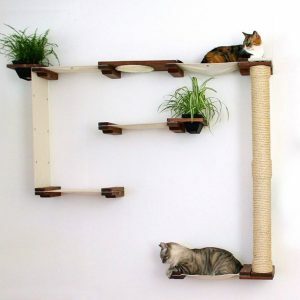 There are pictures that show grayed out complexes in the photos, but that is just to show how it can be incorporated it with other Cat Mod pieces. 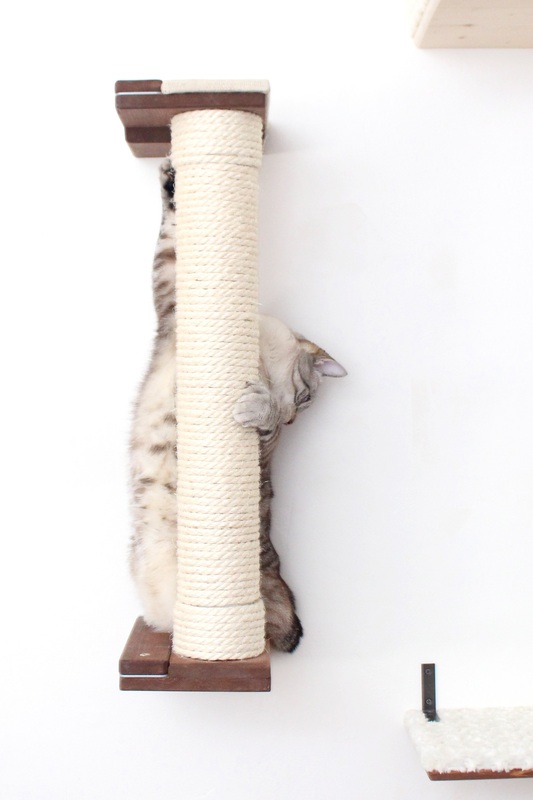 I was worried my cat Pete wouldn't know what to do with a pole up off the ground, but it only took him a few days (and a sprinkling of catnip) to learn that's the good place to scratch and he's getting brave and used to it enough to climb up and down it as well as perch on the top shelf! From the human perspective, I love the clean and simple design. It's extremely livable cat furniture that makes me feel like a stylish cat lady! 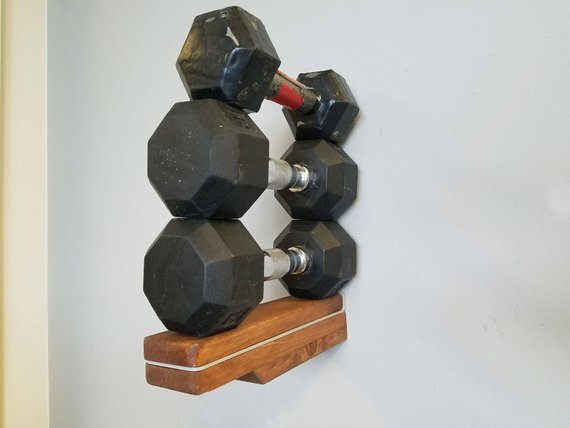 This pole is attached between 2 small shelves and is easy to put up. My cats love it! 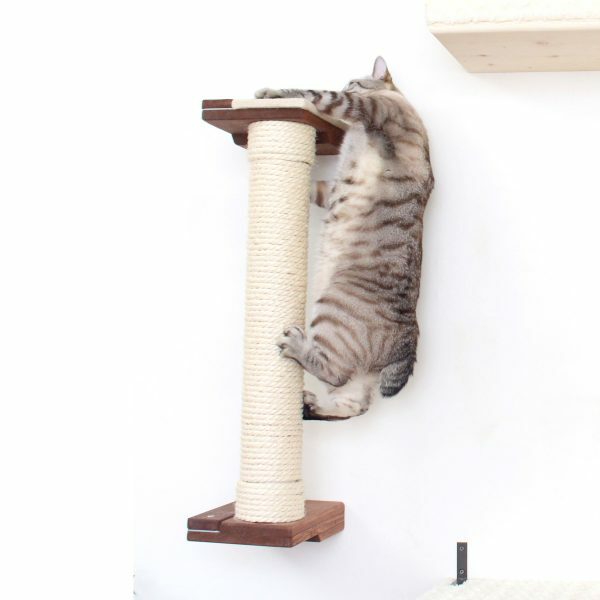 It is placed about a foot off the ground and they can reach up and stretch out nicely. They also love to climb it and can grab the top shelf by the burlap and pull themselves up. 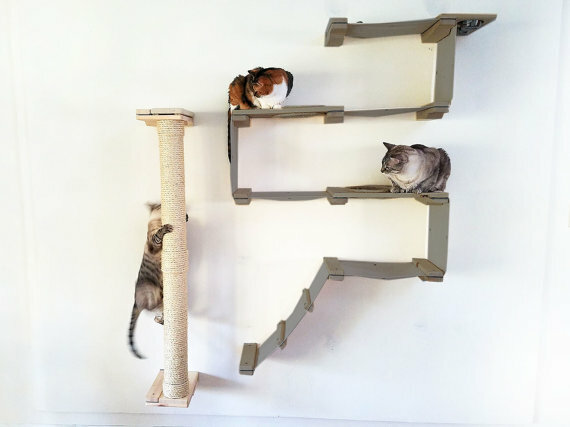 2 cats will play on it by chasing each other, the winner gets to the top first, and then they bat at each other. It looks cool too. A bit stiff putting together but my cat is already having fun with it and he normally takes longer to warm up to new things. 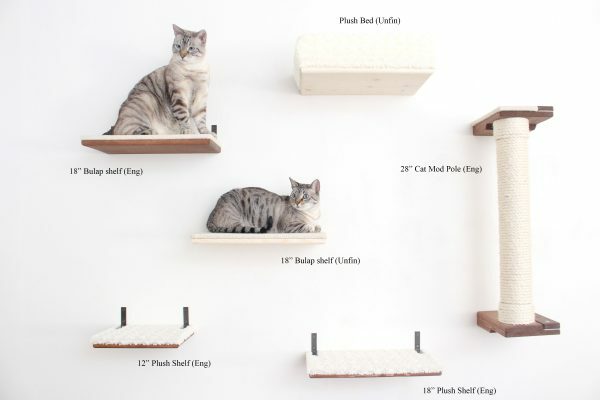 I am always looking around my house finding new ways to set up my walls to keep my 6 cats moving around! It is fun for me and them! 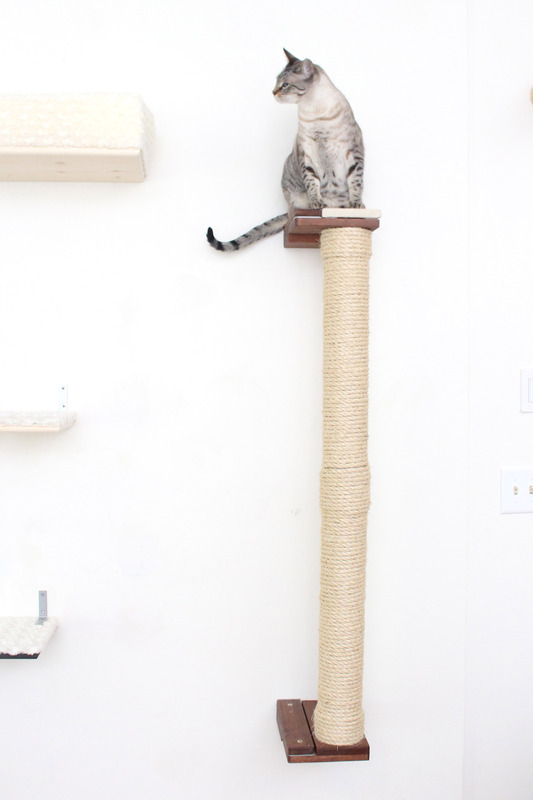 We purchased the sisal pole and our kitties love it! We have a kitty that is a climber so she is in heaven. It is also helping our chubby kitty get her abs back! Great quality!